Writing a scary book for young readers is a tricky business. Where is that line between fun scary and scary scary? When the Thirteen bus hove into sight. It might have been as long as 20 years ago! Read my blog post to find out more about how this frightful ride came together. This entry was tagged mcmichael. Bookmark the permalink. Best-selling author Bonny Becker’s cleverly rhyming text will chill and thrill readers alongside Mark Fearing’s wonderfully funny illustrations, making this book perfect for Halloween story times — and lovers of things that go bump in the night. A young boy takes a terrifying bus ride on his way to his grandmother’s house in Becker and Fearing’s gleefully baleful picture book…Becker’s rollicking rhyme scheme not only captures the rapid, lurching motion of Michael McMichael’s journey, but…it also steadily envelops readers in the rising tension. Fearing’s dark but dynamic illustrations keep pace with the building intensity and intertwine with the text as seamlessly as humor intertwines with horror… rather than pull back and return readers to the dullness of safety, Michael McMichael’s creative and disconcerting solution to free himself from the bus will leave readers with a whole new set of frissons. Dark and delightful—for readers who enjoy chills with their giggles. 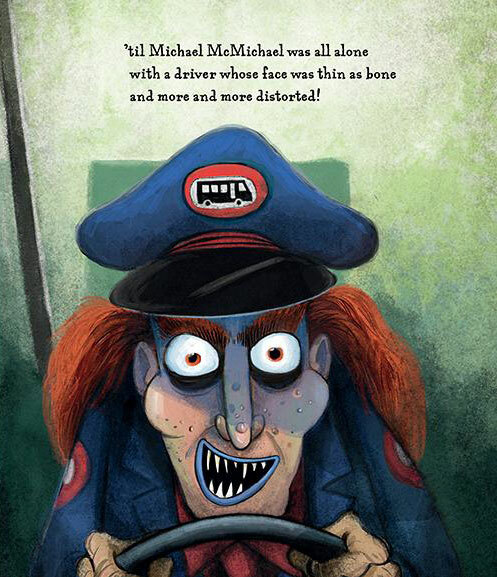 In this child-sized chiller with a twist by author Bonny Becker and illustrator Mark Fearing, the little fellow on the bus is clearly a nice little boy…but when he’s the only passenger left, both bus and driver show their true, fiendish colors. Read Bonny’s blog post to find out more about how this frightful ride came together.